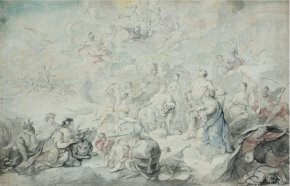 15/6/10 – Acquisitions – Paris, Musée du Louvre and Versailles, Musée national du château – On Friday, 4 June 2010 at an auction in Paris at the Hôtel Drouot (auctioneers : Binoche-Giquello-Renaud) the Versailles château preempted a watercolour by Charles Natoire representing an Allegory for the Birth of a Dauphin (ill. 1), for 19,000 € (without charges). The artist had indeed prepared a painting to celebrate the birth of a male heir to the Dauphin Louis, but a girl was born thus forcing Natoire to rethink his work. He finally painted a very different composition with fewer figures and in a vertical format. Today, this Allegory of the Birth of Marie-Zéphirine de France is held at the château de Versailles. This drawing was probably in the collection belonging to the Goncourt brothers who described it in detail, although inverting the position of the two groups in the foreground . 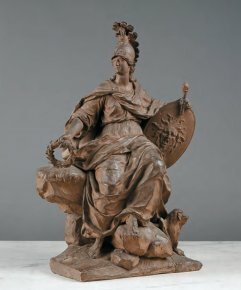 The Musée du Louvre preempted a superb terracotta figure by Guillaume Coustou representing Minerva (ill. 2), which had remained with the artist’s heirs until now, on Wednesday, 9 June 2010 at an auction organized by Daguerre’s. Dating from around 1734, this statuette is a preparation for the sculpture which was located, with its companion piece Mars (whose terracottawas already at the Louvre), on either side of the central pavilion on the northern façade of the Hôtel des Invalides in Paris. The two originals, damaged by pollution, were replaced in 1966 with copies (they are still held at the Invalides but are not displayed to the public). 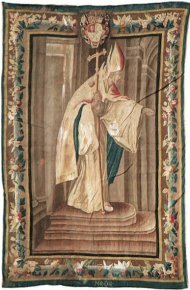 Finally, in this news item highlighting recent preemptions, we would like to point out that during this auction an Aubusson tapestry from the Abbaye Royal de Saint-Jean-d’Angély (ill. 3) was preempted for 4.000 € (without charges) by the Louvre for this city. Dating from the mid-18th century, the work represents a saint bishop, in which the border shows coats of arms decorated with fleur de lys and a head of Saint John the Baptist wearing a royal crown. This iconographic element helped to identify its origin. According to the legend, the skull of Christ’s precursor had belonged to the abbey at Saint-Jean-d’Angély until it disappeared in a fire which took place in 1568, during the French Wars of Religion. “In the foreground, on the right, the nymphs of the Seine offering flowers, on the left, a cave where the spirits of Discord are entering, in the middle cupids playing with terrestrial globes and telescopes”. Quoted by Elisabeth Launay, Les frères Goncourt collectionneurs de dessins, Arthena, 1991, p. 388.